Baptist churches serving Lumbee and other tribes. 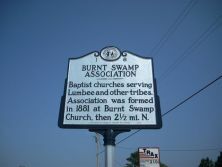 Association was formed in 1881 at Burnt Swamp Church, then 2 1/2 mi. 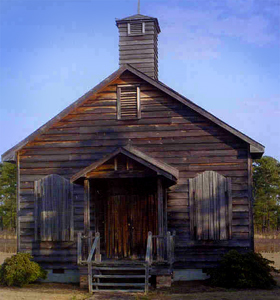 N.
Burnt Swamp Baptist Church was founded on October 2, 1877, by twenty Lumbee Indians. They received encouragement from two local white churches, Raft Swamp and Clyburn Baptist. David Caswell, the first pastor of Burnt Swamp, came from Raft Swamp. Prior to Burnt Swamp’s organization, impromptu religious meetings and revivals had been held among the Lumbee for perhaps two decades, but no organized religion was available to the community. At their 1885 meeting, they resolved to remove “mixed race” from the title, and became the “Burnt Swamp Indian Association of the Croatan Indians,” the first in a series of name changes over the years. 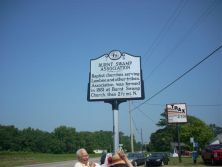 In 1924, in an effort to join the Baptist State Convention, the group changed the name to the Burnt Swamp Missionary Baptist Association of the Cherokee Indians of Robeson County, being strongly encouraged to do so by the white leaders of the Convention. After five years of struggling to gain acceptance, the Association finally was admitted in 1929. The title “Cherokee” subsequently was dropped. The Association was instrumental in the effort to develop Native American schools in Robeson and surrounding counties. In 1887 members helped organize Croatan Normal School. The academy became a source of Native American pride in the area, and was the forerunner to the University of North Carolina at Pembroke. The Association oversaw the development of a Native American orphanage in 1942 and a cultural heritage museum in Pembroke. The Association has continued to expand. Today the Association includes Indian churches in nine counties in North Carolina and South Carolina, as well as in Baltimore, Maryland. Having begun with three Indian churches, the Association now consists of sixty-nine churches and a mission. The Native American tribal groups represented include the Haliwa-Saponi, Lumbee, Pee Dee, Coharie, Waccamaw-Siouan, and Tuscarora. With the exception of two congregations, the churches are served by Native American pastors. The original Burnt Swamp Church. Image courtesy Burnt Swamp Baptist Association.